Master Health Check-ups Cardiac executive check-ups and comprehensive master health check-ups are being carried out on all days except Sundays. Call +918606048999 to schedule an appointment ! Lakshmi Hospital is a Super Speciality Hospital and a major referral cardiac centre in Palakkad, Kerala. Lakshmi Hospital started as a 6-bedded maternity nursing home on 27th August 1972 by founders Dr Kalyani G Menon and Adv P G Menon. Dr Kalyani G Menon, with her experience of 55 years in the field of medicine, is the inspiration driving the hospital to greater heights. Lakshmi Hospital is the first tertiary cardiac care centre in Palakkad. We focus on providing quality medical care to people in and around Palakkad region. The core values that helped start the hospital are at the roots of this institution to this day. The first centre was started on Chittur Road and subsequently a second centre was started on Coimbatore Road in 2012. In August of 1994, Dr P B Jayagopal helped achieve another milestone by starting an Intensive Cardiac Care Unit. In 2008 the first fixed cath lab in Palakkad was set up in the hospital by Philips Healthcare. In December of 2014 this was upgraded to the FD10 version of cath labs from Philips Healthcare.On 10th October 2010 the cardiothoracic unit was also started. Dr P B Jayagopal, with more than 20 years of experience, heads the cardiology department. He is also the Director of Lakshmi Hospital, Palakkad.Our cardiothoracic surgery is headed by Dr. Sumitran and team. The department of general surgery and gastroenterology is headed by Dr Praveen V A since 2006.The orthopedic department was established under the able guidance of Dr Ravi G Nair in 1993. Dr Bindu P A joined the gynaecology department in 2008. Mr.C K Ramachandran, who has over 30 years of experience, joined our management team as the General Manager in 2012. We also have eminent visiting consultants in Anesthesiology, dermatology, diabetology, ENT, gastroenterology, infertility, neurology, oncology, ophthalmology, paediatrics and radiology departments. 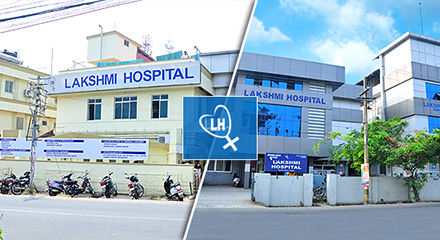 Lakshmi Hospital is a Super Speciality Hospital and a major referral cardiac centre in Palakkad, Kerala. Lakshmi Hospital started as a 6-bedded maternity nursing home on 27th August 1972 by founders Dr Kalyani G Menon and Adv P G Menon.